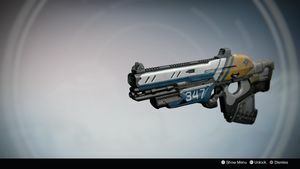 The Boolean Gemini is a weapon designed by a think tank of Guardians and foundry representatives hoping to produce two guns in one. The result: Boolean Gemini maintains a flexible design that allows Guardians to toggle between distinct combat styles for maximum efficiency. Smooth Ballistics: Increased recoil. Boost to range. One Way: Bonus Agility on precision kills. Stacks up to three times. First-person view wielding the Boolean Gemini.